The invention of the push-fit fitting is driven by the demand for faster and easier installation of more reliable plumbing components, while certain changes in water chemistry within the past decade, causing severe corrosion and leaks in some copper pipework circuits, is one of the many reasons for an increasing number of installations performed with Polybutene-1 piping systems. Historically, plumbing has changed dramatically in terms of materials and technology applied with a shift from lead to the use of copper in the early 19th Century, and more recently the development of plastic piping systems and push-fit fittings. The debate of whether to use plastic or copper pipes and fittings, however, remains, with plumbers often making their choices based on habit, rather than through research. Before the introduction of the plastic push-fit fitting, joining pipes in a plumbing circuit used to be a very time consuming activity requiring a high degree of skill and experience to achieve an adequate installation. The same push-in technology is utilised in the fuel, brake, suspension and steering systems of cars made by Ford, Aston Martin, Porsche, Ferrari, Jaguar and BMW. Soldering copper joints involved the use of numerous tools such as a blowtorch, heavy-duty pipe cutters, a solder, emery paper, flux, etc. Such an installation process not only entails a high level of competency, but is also very slow, posing a certain health hazard on the plumber and allowing minimal flexibility if the system needs to be altered at any given time. Highly flexible John Guest layflat pipes and pipe-in-pipe made from Polybutene-1 work very well with push-fit fittings, offering an excellent alternative to the old methods of copper plumbing. The invention of the push-fit fitting in particular led to a reduction of the installation time by up to 50%, where dismantling and modifying the plumbing circuit is easier than ever before. The high durability, reliability and performance of the push-fit fitting is determined by the considerable engineering thought that goes behind the manufacturing of this plumbing component. For example, the JG Speedfit push-in fitting looks a lot more intricate on the inside than one can imagine. 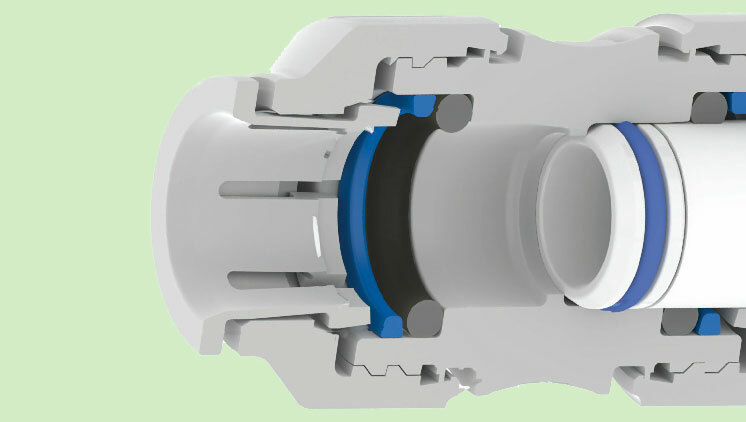 In outline, the technology of a push-fit fitting is defined by three elements - twist and lock cap that increases the compression on the 'O' ring seal around the pipe, locking it into position; stainless steel teeth providing a firm grip and ensuring the pipe stays in place; and several 'O' ring seals eradicating any leakage risks. The introduction of the push-fit concept to the UK market created a completely new shift in the industry and the way plumbing is perceived. The push-fit methodology of putting a plumbing circuit together is ideal for any new-build and refurbishment project due to the flexibility, durability and ease of installation this approach offers. Also, the advantages of Polubutene-1 piping as revolutionised installation and in-use performance with benefits including less connections due to pipe length and flexibility, will not scale-up in hard water areas or corrode in soft water areas, better acoustics and not subject to water hammer. The push-fit model is also easily integrated in house-building technologies such as prefabricated and on-site-assembled dwellings where swift system alterations are essential and time efficiency is a must. The push-fit technology finds its use in a number of industries and what would be interesting to know is that the same JG Speedfit push-in concept used in contemporary plumbing practices is integrated in the fuel, brake vacuum, air suspension and low-pressure power steering systems of some of the leading automotive marques such as Ford, Aston Martin, Porsche, Ferrari, Jaguar and BMW. The development of the push-in applications has certainly revolutionised the market, however, it is not the only innovation to have an impact on the way plumbing is performed. The ever-increasing use of lighter and more flexible materials such as Polybutene-1 allows for swifter, smoother and easier installations with little environmental impact and better performance. It is essential to discuss the reliability of the common plastic systems compared to the copper alternatives in view of the variable chemical and microbiological composition water supply has shown within the past ten years. Certain changes in the water chemistry, unrelated to its potable properties, pose a risk to copper fittings and pipe leading to serious corrosion induced leaks. Copper pipework circuits are believed to last for as long as 25 years, however, system failures could appear in just a couple of years. Pitting corrosion is a rather usual form of copper pipe damage, which could occur even within a few months of installation. The main reason is a breakdown of the pipe's semi-protective film leading to surface perforation. Most commonly pitting corrosion in the UK hits those parts of the plumbing system that never exceed 40°C (mainly in cold water pipes with high velocity areas), where water supplied is hard, lacking organic matter and having pH values between 7.0 and 8.2. In comparison, Polybutene-1 plumbing circuits are resistant to such conditions and numerous tests have proven that these pipework systems are very suitable for acidic conditions. The combined use of plastic push-fit fittings and Polybutene-1 pipe brings flexibility to the installation process, offering system longevity and durability even with the variable microbiology of water supply. It is important for installers to improve their know-how on the current market trends by making their choices based not on what they are used to, but by adopting installation practices that could bring ultimate system efficiency and lifelong reliability to their customers.